Welcome the Chapter 3 of our Ultimate Guide to Increasing Reader Engagement on Disqus! Catch up on Chapter 2 on turning comments into engaging content. Events bring people together around a shared experience, creating a powerful sense of community. An event could be anything from a Q&A forum, a live video stream, or simply a place to hang out. As long as it involves a group of people gathered together by a common purpose, you have an event. Agenda: What is the purpose for people convening together and the plan for the event? What is the mode of interaction? Shared time and space: When and where will this event happen? With Disqus, comments posted in a discussion appear in real-time, creating a space that feels lively and active. Participants can customize their user profiles with fun avatars to establish unique identities that others can readily recognize. Commenting is also flexible for different modes of expression including support for embedding rich media from services like YouTube, Twitter, and Giphy. Reddit AMA’s (Ask Me Anything) are a great example of successful online events. In an AMA, celebrities and subject-matter experts answer questions about any topic from the community. Over the years, notable people have stopped by the IAmA subreddit to participate in an AMA including Bill Gates, President Obama, and even an astronaut living in space! Comment from discussion I am Gordon Ramsay. AMA.. While you may not attract a famous celebrity, you can host a Q&A featuring members of your team including contributors and editors. 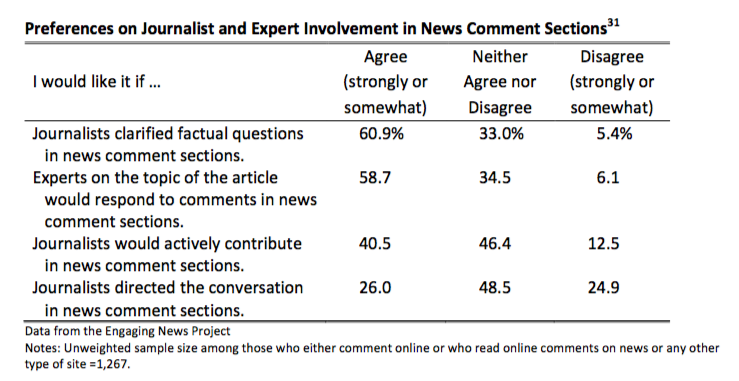 According to a survey of news commenters and readers by the Center for Media Engagement, nearly 60% said that they would like to see experts weighing in the comments section. In other words, be part of the conversation! If you interview someone for a story, invite them to participate in the comments. It helps to have someone curating the comments for relevant questions to respond to. Whenever The Wirecutter receives a question about a product recommendation on Twitter, their social media manager directs it to the appropriate expert on their team to respond. Gotchya! @LaurenDragan is there any wireless earbuds that could offer a higher music quality, regardless of price? Your publications’ voice extends to the comments. Your readers expect you to be listening and responding. If you’re not, then don’t expect a community to emerge from simply hosting comments. This should be a team effort so don’t be afraid to encourage your team to chime in with readers. One of my favorite examples of an event that brings people together online is Stop Lurking Day, hosted by SpoilerTV, a site for TV news and reviews. Every community has its lurkers, those members who follow the discussions but never participate. To encourage readers who visit regularly but have never left a comment, SpoilerTV created Stop Lurking Day so that lurkers can finally step into the spotlight and introduce themselves to the community. These brave souls are then quickly met with the friendly, welcoming arms of the community who are always eager to make newcomers feel special. If you have an example on hosting an event with your community, please share it in the discussion below. We’ll feature the best comment once the discussion is underway! Don’t forget to subscribe to our blog to get notified when we release the next chapter in our guide to increasing reader engagement.